TP53 gene mutations occur in more than 50% of human cancers and the vast majority of these mutations in human cancers are missense mutations, which broadly occur in DNA binding domain (DBD) (Amino acids 102–292) and mainly reside in six “hotspot” residues. TP53 G245C and R273H point mutations are two of the most frequent mutations in tumors and have been verified in several different cancers. In the previous study of the whole genome sequencing (WGS), we found some mutations of TP53 DBD in esophageal squamous cell carcinoma (ESCC) clinical samples. We focused on two high-frequent mutations TP53 p.G245C and TP53 p.R273H and investigated their oncogenic roles in ESCC cell lines, p53-defective cell lines H1299 and HCT116 p53−/−. MTS and colony formation assays showed that mutant TP53 G245C and R273H increased cell vitality and proliferation. Flow cytometry results revealed inhibition of ultraviolet radiation (UV)- and ionizing radiation (IR)- induced apoptosis and disruption of TP53-mediated cell cycle arrest after UV, IR and Nocodazole treatment. Transwell assays indicated that mutant TP53 G245C and R273H enhanced cell migration and invasion abilities. Moreover, western blot revealed that they were able to suppress the expression of TP53 downstream genes in the process of apoptosis and cell cycle arrest induced by UV, which suggests that these two mutations can influence apoptosis and growth arrest might be due, at least in part, to down-regulate the expression of P21, GADD45α and PARP. These results indicate that mutant TP53 G245C and R273H can lead to more aggressive phenotypes and enhance cancer cell malignancy, which further uncover TP53 function in carcinogenesis and might be useful in clinical diagnosis and therapy of TP53 mutant cancers. TP53, as an important tumor suppressor gene, plays a crucial role in the process of maintenance of normal cellular function. Wild-type (WT) TP53 can be activated to regulate many cellular programs like cell cycle arrest, DNA repair, apoptosis, autophagy, senescence, metabolic remodeling and innate immunity [1–3]. TP53 gene mutations occur in more than 50% of human cancers, including liver cancer, breast cancer, bladder cancer, stomach cancer, colon cancer, prostate cancer, soft tissue sarcoma, ovarian cancer, brain tumor, esophageal cancer, lung cancer and osteosarcoma [4, 5]. The vast majority of TP53 mutations in human cancers are missense mutations, which broadly occur in DBD (Amino acids 102–292) and mainly reside in six “hotspot” residues (p.R175, p.G245, p.R248, p.R249, p.R273, and p.R282) [4, 6, 7]. The majority of TP53 gene mutations in human cancers abolish its tumor-suppressive function to bind to specific DNA sequences recognized by wild-type TP53, which is called loss of function (LOF) [4, 8]. Some TP53 mutations reduce the reaction with wild-type TP53 downstream genes, resulting in the inactivation of wild-type TP53 or its response elements, which lead to gain of oncogenic function (GOF) [9–12]. Moreover, the mutant P53 proteins frequently exhibit a dominant negative effect on the wild-type TP53 allele by interacting with wild-type TP53 and reducing cellular concentration of functional wild-type TP53, which can form wild-type TP53 tetramer structure but lose the activity of wild-type TP53 [1, 3, 4, 13]. As previously reported, TP53 G245C and R273H point mutations are two of the most frequent mutations in tumors and have been verified in several different cancers . 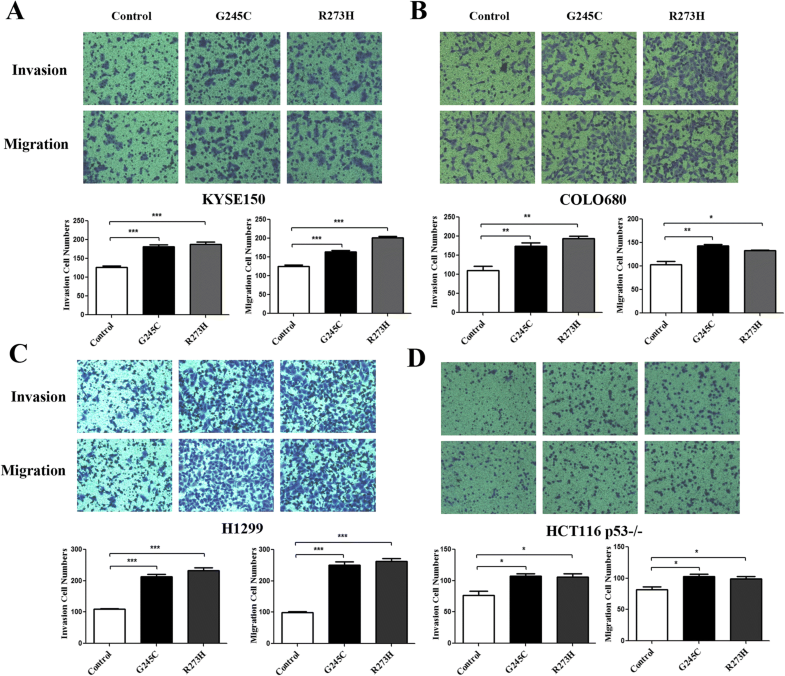 It has been reported that R273H can enhance invasion of lung cancer cells  and promote invasion and migration in endometrial cells . G245C has been confirmed to result in changes in the conformation of the TP53 DNA-binding domain, compared with wild-type TP53 . However, the properties of such mutations are not well characterized and there is little information on G245C and R273H mutations in ESCC and p53-defective cancer cells. From the previous results of WGS in ESCC patients’ samples , we focused on these two mutations and verified their tumorigenicity in ESCC cell lines, p53-defective cell lines H1299 and HCT116 p53−/−. We applied to determine the influence of G245C and R273H mutations of TP53 on cell proliferation, apoptosis and cell cycle arrest induced by UV, IR and Nocodazole in human cancer cells. The current study aims to explore the function and impact of TP53 G245C and R273H mutations on cancer cell proliferation, migration, invasion, apoptosis and cell cycle arrest after UV, IR and Nocodazole treatments, which might serve as a potential diagnostic and therapeutic target in TP53 mutant cancers. According to the previous results of whole genome sequencing (WGS) in ESCC patients’ samples , we found that TP53 somatic mutations were present in sequenced tumors. TP53 at codons G245 and R273 were identified in respectively as shown in Tables 1 and 2. Total genomic DNA of ten ESCC cell lines were extracted and the mutation sites in 11 TP53 exons were validated by Sanger Sequencing (Table 3) and their expression were assessed by real time PCR assays (Fig. 1a). Short interfering RNAs (siRNAs) were applied to knock down P53 expression levels in KYSE150 and COLO680 cells, which express wild-type and relatively higher levels of P53. The knockdown efficiency of P53 by siRNAs were verified by Western blot (Fig. 1b). 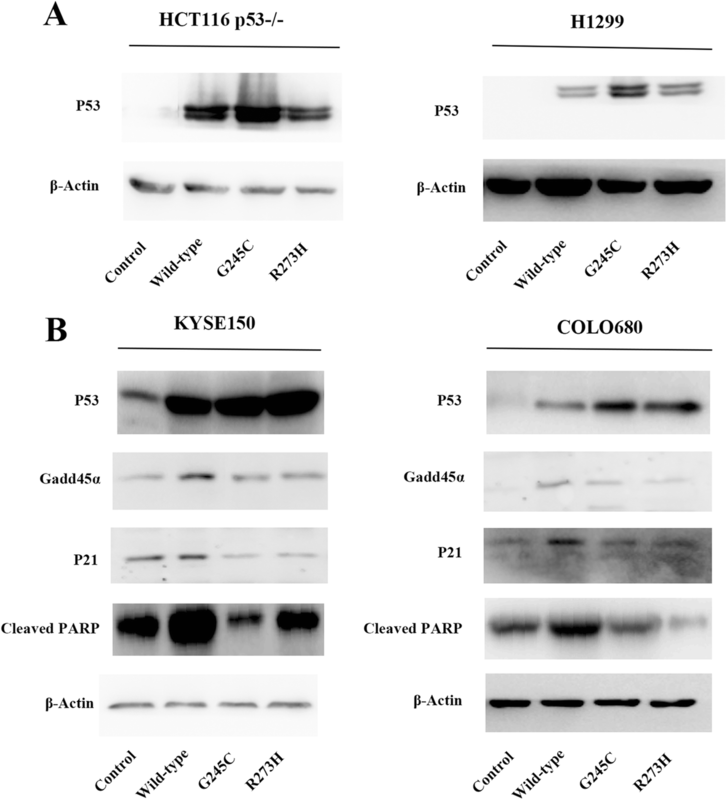 We designed gray scale scanning in KYSE150 and COLO680 to examine the efficiency of silencing of p53, and the result indicated that p53 was knockdown by siRNAs obviously (Fig. 1c). 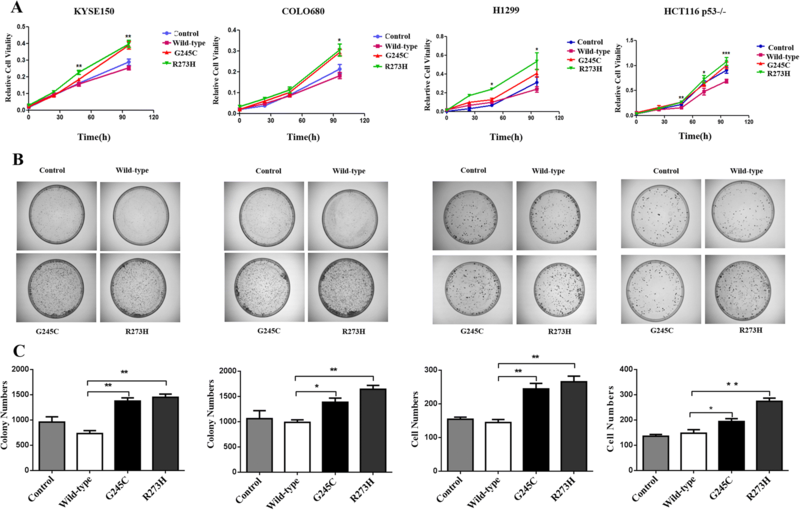 Additionally, siRNAs and TP53 plasmids were transiently cotransfected in KYSE150 and COLO680 cells, and we validated the effects of TP53 G245C and R273H mutant transfectants on cellular malignant phenotypes including cell growth, colony formation, migration and invasion. To determine the role of mutant TP53 on tumor cell malignancy, MTS assays were used to test the impact of mutant TP53 on cell proliferation, the different characteristics of the various TP53 transiently cotransfected cell lines were analyzed and shown in Fig. 2a. The effects of the TP53 mutations on proliferation were reflected in colony formation assays (Fig. 2b), more colonies were presented in cells expressing mutant TP53 than that seen in wild-type TP53 cells. Additionally, the mutant TP53 led to a significantly greater promotion of cell growth than wild-type TP53 transfectants. Compared with control cells, wild-type TP53 suppressed cell proliferation. Taken together, these results illustrated that the TP53 G245C and R273H mutant cells strengthened cell proliferation abilities. We next determined the influence of TP53 G245C and R273H on invasion and migration activities. Matrigel™ invasion chamber system was employed to test the properties of invasion and migration, the mutant transfectants showed higher levels of membrane penetration abilities. Invasion and migration were significantly higher in cells expressing TP53 G245C and R273H than vector controls in KYSE150 (Fig. 3a) and COLO680 (Fig. 3b), p53-defective cell lines H1299 (Fig. 3c) and HCT116 p53−/− (Fig. 3d) transfected with relative plasmids. Based on the proliferation and invasion assays, we concluded that TP53 G245C and R273H mutations are gain of oncogenic function in ESCC cell lines and p53-defective cell lines H1299, HCT116 p53−/− cells. We also examined effects of TP53 G245C and R273H on cell apoptosis and cell cycle arrest following UV, IR and Nocodazole treatments. We assessed UV- and IR-induced apoptosis in KYSE150 and COLO680 cotransfected with control, wild-type TP53, TP53 G245C, TP53 R273H plasmids and siRNAs as well as H1299, HCT116 p53−/− cells. As shown in Fig. 4a, the percentage of cells undergoing apoptosis after UV 30 J for 12 h treatment was less in G245C and R273H than WT and control cells, compared to UV 30 J for 0 h in ESCC cell lines. Furthermore, the ratio of apoptosis cells after IR 4Gy for 12 h in G245C and R273H was dramatically less than WT and control cells in KYSE150 and COLO680 cell lines (Additional file 1: Figure S1A), which were consistent with the data described above. In the analysis of cell cycle, we found that the abilities of cells performing G1 arrest after UV 30 J for 12 h treatments in the G245C and R273H were weaker than WT and control cells, compared to UV 30 J for 0 h (Fig. 4b). In addition, this phenomenon was also observed in KYSE150 and COLO680 cells which were treated with IR 4Gy for 12 h (Additional file 1: Figure S1B). Nocodazole is a microtubule-disrupting agent to arrest cells in mitosis by triggering the mitotic checkpoint. Furthermore, we also determined cell cycle arrest induced by Nocodazole (0.5μg/ml) for 12 h. We demonstrated that, in KYSE150 cell line, G2/M ratio was diminished in these two mutant transfected cells after adding Nocodazole for 12 h. Meanwhile, the G1 phase enhanced relative to the wild-type cells. While in COLO680 cell line, the reducing ratio of G2/M in TP53 R273H mutant transfected cells after adding Nocodazole treatment was not significantly statistic different, nevertheless, the decreasing ratio of G2/M in TP53 G245C did have significantly difference, which suggest that G245C and R273H can abrogate cell response to Nocodazole induced cell cycle arrest (Additional file 1: Figure S1C). These results indicate that TP53 G245C and R273H confer stronger resistance to UV- and IR- induced apoptosis and attenuate UV, IR as well as Nocodazole induced cell cycle arrest. Increasing evidences suggest that tumor cells express highly stabilized mutant TP53 even in the absence of cellular stress, a prominent explanation is that mutant TP53 fails to initiate the transcription of the MDM2, which consequently leads to a collapse of the negative feedback loop driven by MDM2 and the maintenance of high P53 levels in cells [17–19]. Additionally, the expressions of P53 were verified by Western blot in Fig. 5a. As shown in Fig. 5a, P53 expression levels were increased in TP53 G245C and R273H mutant cells than wild-type and control cells. TP53 gene can be involved in many important cellular functions through the transcriptional regulation of its downstream genes. To further explore the mechanism of mutant TP53 responses to cell cycle arrest and apoptosis, we examined the expression levels of several TP53 downstream genes that participate in the process of cell cycle arrest and apoptosis, including P21 and GADD45α which play vital roles in cell cycle arrest and apoptosis response, acting as both mediator and effector [20, 21]. Furthermore, the impacts of G245C and R273H mutations of TP53 on the protein levels of P21 and GADD45α were determined, the two mutations were found greatly attenuated the induction of P21 and GADD45α after UV treatment (Fig. 5b). Hence, we speculate that G245C and R273H influence the process of cell cycle arrest and apoptosis might be due, at least in part, to down-regulate P21 and GADD45α protein levels. In addition, PARP is cleaved to PARP p85 rapidly during apoptosis . Similarly, we have found that UV-induced cleaved PARP levels in control and WT TP53 cells were elevated, but decreased markedly in G245C and R273H cells. These results further suggest that there exist a defect in UV-induced apoptosis in mutant cells (Fig. 5b). TP53 plays a vital important role in preventing tumor development. Under oncogenic or genotoxic stress, wild-type TP53 is activated to inhibit cell growth through inducing cell-cycle arrest or apoptosis process . It has been reported that more than 50% of human cancers carry somatic mutations of TP53  and that mutant TP53 not only lose their tumor-suppressive functions [4, 8] but also acquire new transforming abilities to promote tumorigenesis, which are independent of wild-type TP53 [9–12]. Consistent with previous reports, codons R273 and G245 are two of the most frequently mutant hot spots in the IARC database . These two mutations have been proved to eliminate the function of wild-type TP53 including TP53 mediated cell cycle arrest and apoptosis, as well as to contribute to tumorigenesis through regulating some downstream genes. It is also evident that missense mutations may convert TP53 from a tumor suppressor gene into an oncogene, and it is of both scientific and clinical interest to understand the gain of function activities of mutant TP53 . In this study, we identified these two mutations in clinical ESCC patients’ samples and investigated their oncogenic roles in ESCC cells. We found that TP53 G245C and R273H could promote cell proliferation, colony formation, invasion and migration activities. Moreover, TP5 3G245C and R273H mutations confer stronger resistance to UV- and IR- induced apoptosis and attenuate UV, IR as well as Nocodazole induced cell cycle arrest. Mutant P53 protein often accumulates at extremely high levels in tumors, which is partly due to the disruption of the transactivation of MDM2, which serves as a negative feedback loop down-regulating P53 protein levels in the absence of DNA damage signals and maintaining wild-type P53 at the low levels in normal tissues [17–19]. Wild-type P53 protein primarily functions as a transcription factor to transactivate many genes in the progress of cell cycle arrest and apoptosis, while mutant P53 protein abrogates transactivation of these target genes such as P21, GADD45α and PARP [1, 7]. Cyclin-dependent kinase (CDK) inhibitor P21 (also known as P21WAF1/Cip1), acts as an important transcriptional target of TP53  to inhibit the kinase activity of CDK4,6/cyclin-D and CDK2/cyclin-E leading to G1/S and G2/M cell cycle arrest in response to TP53 activation after cellular or genomic stress [20, 25, 26]. P21 is a tumor suppressor gene, but it can also serve as an oncogene in certain cellular process of human cancers . In our results, we found that both TP53 G245C and R273H mutations abolished wild-type p53 activated induction of P21 protein after UV treatment (Fig. 5b). A direct outcome of the scenario is shown by the TP53 induced P21 mediated G1/S arrest of these cancer cells, which is evacuated when the G245C and R273H mutations express high levels in the cells. It has been repeatedly found that GADD45α is induced by DNA damage and other stress signals like UV, IR or Nocodazole, which are associated with cell cycle arrest and apoptosis [21, 27, 28]. GADD45α can displace PCNA from the cyclin D1 complex to prevent DNA replication during S phase , bind to CDK1 to inhibit CDK1/cyclin B1 activity in vitro , and behave as a bridge between P53-dependent cell cycle checkpoint and DNA repair . GADD45α is necessary for normal TP53 activation by stress signals and its transcription can be stimulated by TP53. Its level rises notably in apoptotic cells, while inhibition of GADD45α expression level reduces apoptosis in response to DNA damage . In our study, we have found that the induction of GADD45α expression was reduced dramatically after UV treatment in the cells expressing mutant TP53 G245C and R273H, while it is up-regulated consistently in wild-type TP53 cells (Fig. 5b), which suggests that these two TP53 mutations lose the abilities to transcriptionally activate GADD45α and such reduction of GADD45α expression further attenuate apoptosis. Hence, knowing the particular TP53 mutation of cancer may have utility for management in clinical practice since apoptosis is a major effect of chemotherapy or radiotherapy. PARP enzyme plays an important role in DNA damage repair, differentiation, apoptosis, transcription, and DNA replication [29, 30]. PARP is converted from the 116-kDa form to fragments of 89 and 24 kDa and can be cleaved to PARP p89 early during the process of apoptosis [22, 31]. The cleaved PARP is one of biomarkers for the detection of apoptosis. In addition, PARP is a target of apoptotic caspase-3 and its two proteolytic fragments have been considered to be sign of functional caspase activation . In the study, we have observed that UV treatment lead to increasing cleaved PARP levels in control and wild-type TP53 cells, but decreasing in cells expressing G245C and R273H (Fig. 5b), which suggest that there exist a defect in UV-induced apoptosis in the mutant TP53 cells. Interestingly, we have identified TP53 mutations (G245C and R273H) are distributed only in group of smokers in ESCC (5/88) and none is found in non-smokers group (Additional file 2: Figure S2) , which suggest that TP53 mutations may be induced by tobacco exposure and lead to ESCC progress. As it is reported that several TP53 point mutations are related to the effect of cigarette exposure in lung cancers [33–35] and squamous cell carcinomas of the head and neck , which is similar to our finding in patients with ESCC, a group that the percentage of smokers have higher TP53 mutations. Undoubtedly, it is possible that the link between tobacco-induced TP53 mutations and ESCC is influenced by other factors like tumor type and gender, age and ethnic of the patients , so realizing the relationship between tobacco-induced TP53 mutations and ESCC will be a powerful tool that connect disease to its specific cause. In summary, this study has demonstrated that two malignant TP53 mutations (G245C and R273H) revealed strong oncogenic properties in ESCC cells, indicating that such TP53 mutations may play important roles in carcinogenesis and development of malignancy of ESCC. Given the important roles of mutant TP53 G245C and R273H in tumorigenesis and enhancing cancer cell malignancies, it might have contributions to future diagnosis and therapy in TP53 mutant cancers. P53-SN3 was constructed from 1.8 KB-length of TP53 cDNA sequence which was cloned into the BamHI sites of the expression vector. Two mutant TP53 plasmids G245C and R273H were generated following the manuscript of QuikChange® Site-Directed Mutagenesis Kit (Agilent, USA). The human ESCC cell lines (KYSE2, KYSE30, KYSE70, KYSE180, KYSE410, KYSE450, KYSE140, KYSE510 and COLO680) were provided by Professor Y. Shimada of Kyoto University. The HCT116 p53−/− cell line was brought from University of Pittsburgh by Professor Qimin Zhan. The H1299 cell line was purchased from ATCC and the catalogue is CRL-5803™. 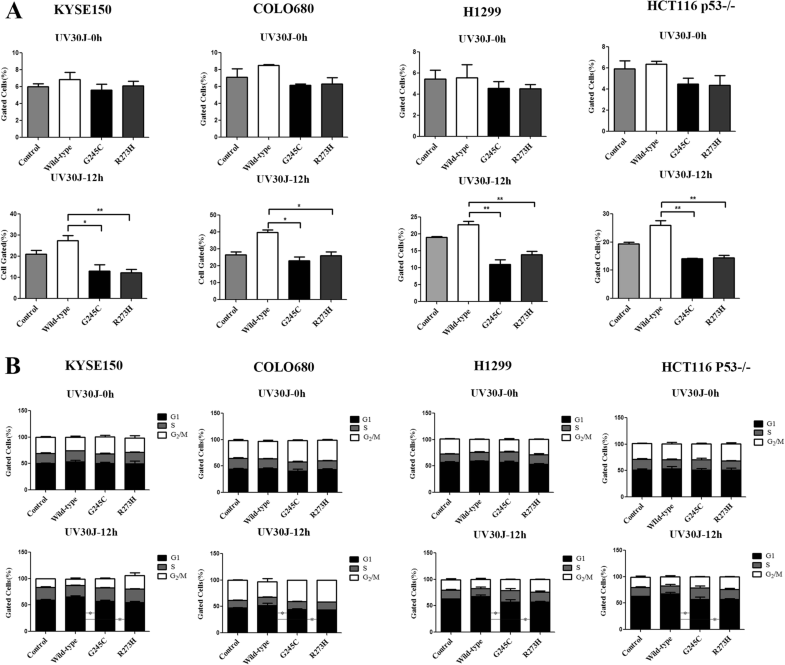 The ESCC cell lines KYSE2, KYSE30, KYSE70, KYSE140, KYSE180, KYSE410, KYSE450, KYSE510, COLO680 and the human lung cancer cell line, H1299 were cultured in 90% RPMI1640 medium, with 10% fetal bovine serum and antibiotics, at 37 °C, 5% CO2; KYSE150 was cultured in the medium of 1:1 mixture of Ham’s F12 and RPMI-1640 containing 2% FBS and antibiotics at humidified atmosphere with 37 °C, 5% CO2, the human colorectal cancer cell line, HCT116 p53−/− was grown in 90% DMEM medium with 10% fetal bovine serum, at 37 °C, 5% CO2. When cells were grown to 70–80% confluence, they were transiently cotransfected with the relative plasmids and siRNAs simultaneously using Lipofectamine2000 (Invitrogen) according to the standard procedure. For siRNAs transfection and plasmids transfection, the density of cells was grown to 40–50% and 70–80% individually. MTS assays were employed to analyze cell viability by a dye staining method using MTS reagent. 3000 cells per well were suspended in 96-well plates with 200 μl medium and grown for 96 h. Then, cells were incubated with MTS (0.5 mg/ml) and measured on an ELISA plate reader with the wavelength of absorbance at 490 nm and 630 nm at 0 h, 24 h, 72 h and 96 h of culture for proliferation assays, and percentage of respective basal levels (MTS concentrations of wells without cells) was calculated. For a colony formation assay, cells were seeded in 60 mm plates at a concentration of 500 cells per well and changes culture with media every 72 h. Colonies were fix with methanol and stained with methanol and 0.5% crystal violet-acetic acid solution after 14 days, then colonies were visualized by fluorescence microscope and quantitated. For apoptosis studies, an Annexin V-FITC/PI apoptosis assay kit (NeoBioscience, Shenzhen, China) was employed. After 48 h transfection, cells were washed with PBS, stained with Annexin V-FITC and propidium iodide (PI) according to the manufacturer’s protocol and quantitated by using flow cytometry (Becton-Dickinson, San Jose, CA, USA) to examine the apoptotic cell numbers. Wild-type and mutant TP53 transfected cells were seeded in six-well plate at a density of 106 cells per well. After 48 h, cells were collected by trypsinization and centrifugation and washed with PBS. The cells were fix with precool 70% ethanol (v/v) overnight at − 20 °C, then centrifugation and washed with PBS. The cells were stained with PI (Propidium, 50μg/ml) 30 min at 37 °C and analyzed by flow cytometry (Becton-Dickinson, San Jose, CA, USA). Percentage of cell cycle cells was calculated according to the number of cells in the respective phase. Cells were transfected with wild-type and mutant TP53 plasmids for 48 h, total cell lysates were collected using lysis buffer (1 × PBS + 4%NP-40 + 0.2%proteinase inhibitor), 2 × SDS–PAGE sample loading buffer, and boiled for 5 min. 80 μg protein was performed and fractionated by SDS–PAGE, then semi-dry transferred to polyvinylidene difluoride membrane which was probed with antibodies for relative antibodies. Secondary antibodies were incubated, then visualized and quantified using Image Quant software (GE Healthcare Biosciences, Pittsburg, PA). Total genomic DNA was extracted in ten ESCC cell lines using TIANamp Genomic DNA kit (TIANGEN, Cat #DP304–03) according to the standard procedure. Each DNA (2 μl) was amplificated by PCR and 11 exons of TP53 were sequenced (Sino Geno Max). To prepare the invasion assay, a Matrigel™ invasion chamber (BD Biosciences, Bedford, MA) was employed to evaluate the invasive activity of TP53 mutant and WT cells. Thoroughly mixing the sufficient Matrigel™ matrix with serum-free RPMI basal medium and carefully adding 0.1 ml of the diluted Matrigel matrix solution to each insert, then using the Matrigel™ matrix solution to incubate plates for 2 h in culture incubator, 37 °C, 5% CO2. Preparing cell suspensions in serum-free RPMI basal medium containing 3 × 104 cells/ml for the 24-well chamber and subsequently filled with 600-800 μl RPMI-1640 medium with 20% FBS into each wells under the chambers. Cell invasion chambers were incubated in a humidified tissue culture incubator at 37 °C, 5% CO2. After overnight incubation, cells which invaded through the Matrigel™ membrane were fixed with methanol and stained with methanol and 0.5% crystal violet-acetic acid solution. For the migration studies, the method as previously described and excluding the Matrigel™ matrix solution preparation was used. Invasive and migration cell numbers were visualized by fluorescence microscope and quantitated. Data for cell proliferation, invasion, migration, cell cycle and apoptosis were obtained at least in triplicate and employing GraphPad Prism v.5 software, expressed as mean ± SD (n ≥ 3). Quantization level of western blot was by Image J 1.8.0 software. Statistical differences were analyzed by the Student’s t-test (two-tailed), while analysis of variance (ANOVA) was used to determine whether there were any significant differences between groups. A P-value of less than 0.05 was considered to reflect significant differences. For ESCC clinical data, differences between groups were analyzed by the Fisher’s exact test. We gratefully thank Prof. Yongmei Song for the WGS data and technical advice. We also gratefully thank Mr. Tao Xu for skillful assistance with the FACS analyses and Mr. Xiao Liang for the technical services of 7300 Real-time PCR Detection System and fluorescence microscope. In addition, we thank Dr. Y.Shimada of Kyoto University for providing the ESCC cell lines. The design of the study is supported by the National 973 Program (2015CB553904). The collection of the data is supported by National Natural Science Foundation of China (81321091, 81672455 and 81230047) and the analysis of the data is supported by National Sci-Tech Support Plan (2013BAI01B07). The interpretation of data and the writing of the manuscript are supported by Beijing Nova Program (xx2018040) and CAMS Initiative for Innovative Medicine (2017-I2M-3-004). NK was responsible for all the experiments and drafted the manuscript, YW revised the figures and analyzed the data, SCG mainly carried out the part of cell cycle using Nocozazole by flow cytometry, YWO and JC were responsible for acquisition of data and interpretation of data, GCW contributed the supplementary S2 data, DL and QMZ was responsible for the overall design of the study and revising of the manuscript. All the authors gave final approval of the version to be published and approved the final submission.